Enjoy the very best of the North Sea’s beautiful coastline on the North Sea Trail. Walk in the footprints of famous explorers, capture the view from towering cliffs and learn how the North Sea has shaped the landscape and lives of people beside it for generations. The North Sea Trail is more than just a path… you’ll have a great time! The North Sea Trail is an international project between seven countries around the North Sea and 26 partner areas. The project’s aims are to support sustainable tourism and to explore the heritage of communities along the North Sea coast. Visit the official Wikipedia page to read more about the trail. The North Sea Trail in Scotland takes walkers through some wonderfully diverse landscapes of natural and cultural heritage significance. Scotland has an astonishingly varied coastline for walking. Walk by romantic sheltered bays framed with rolling sand dunes, tidal estuaries and salt marshes, rocky shores and rugged cliffs. These environments support a huge number of seabird colonies such as gannets, skuas, puffins, and kittiwakes, and other migrants from around the North Sea such as pink-footed geese, dunlin, and knot. The shallow North Sea waters of Scotland also support populations of whales and dolphins. All of which makes for a fantastic wildlife spectacle. You are bound to experience genuine Scottish hospitality and a warm welcome in any of the traditional fishing villages up and down the coast, where you can also see “clinker-built” fishing boats characteristic of North Sea heritage. Explore historic castles and churches, as well as ancient standing stones and prehistoric sites. Why not combine your exploration with a visit to a distillery, experience a traditional Scottish ceilidh, and don’t forget your golf clubs, fishing rod, and binoculars. Walkers are truly welcome in Scotland, and the North Sea Trail guarantees some spectacular walking opportunities whatever your capability, or time available. From the cliffs at John O’Groats on the northeast tip of mainland Scotland around the Moray Firth to the picturesque sea-town of Cullen in Moray is about 180 miles / 272km by road – but an astonishing 470 miles / 750km round every bay and inlet. The varied coastal landscape includes long stretches of unspoiled and open sandy shore as well as dramatic cliffs and headlands. With mountains and moors as a backdrop, the spectacular scenery and wildlife is of international importance. Our fascinating coastal heritage, including Pictish and Viking, remains, offers plenty of historical themes to explore. The towns and villages around the firth each have their own unique character– from tiny fishing settlements clustered gable-end to the sea, to the city of Inverness, the Highland capital. Sheer diversity is the theme of the Moray Firth journey- both in terms of terrain and what there is to see and do. While not a continuous trail, the coastline offers many sections with pathways and good walking, such as the long sandy or shingle shores at places like Lossiemouth and Dornoch. There is a wealth of walking options suitable for all abilities, from the towpath by the Caledonian Canal to the sheltered sandy bays of the inner firths, to cliff top walks around Duncansby and Wick. Walkers can often enjoy close-up views of wildlife including the resident bottlenose dolphins – startlingly close inshore on occasion, especially in the inner Firth. In the ‘rain-shadow’ of the mountains, and sheltered from the prevailing southwesterly winds, the Moray Firth also enjoys low rainfall and high sunshine statistics as a further bonus! The area has for long welcomed visitors and has some old-established traditional resorts such as Nairn and Dornoch, both noted for golf. Inverness, the Highland capital, also has plenty of choices. Places to stay around the Firth not only include everything from budget hostels to exclusive country-house hotels, but also some options with a special Moray Firth flavor. These include accommodation in a converted herring drifter fishing boat, a (haunted!) 12th-century castle and a former lighthouse keeper’s cottage. Local restaurants and hotels offer a wide variety of menus, many offering fine, locally sourced produce and seafood. VisitScotland, the national tourist board, operates an accommodation grading and booking scheme, enabling the visitor to make an informed choice, whatever the budget. It is located on the North East shoulder of Scotland. One of Scotland’s largest Councils, it has a diverse landscape from the Cairngorm Mountains in the West to the three main river valleys of the Dee, Don, and Deveron with rich agricultural land like the Howe of the Mearns located close to a 250-kilometer coastline, which is as varied as it is long. This coastline includes extensive beach and dune systems, towering cliffs and secluded coves all linked by the North Sea Trail – The Aberdeenshire Coastal Path. The natural beauty of the coast is complimented by the forty or so coastal towns and picturesque fishing villages such as Collieston and Crovie and includes the major fishing ports of Fraserburgh and Peterhead. The main public transport link is Aberdeen city, which provides an excellent start point for a visit to the coast of Aberdeenshire. As the trail follows the coast very closely and the coastal road is never more than 3 kilometers from the coast, easy connecting paths allow access to the coastal bus services. These enable the walker to plan a day’s expedition and return to base. The coastal towns and villages have a wide range of accommodation from quality Hotels to a wide variety of Bed and Breakfasts establishments which range from fishing stations to farmhouses. Bunkhouse accommodation is not yet well developed but camping is available on the twelve caravan and camping sites on the coast. Eating out also offers a wide choice to the visitor. Traditional Fish and Chip restaurants and Take Aways, where the fish is as fresh as it gets, can be found in most towns and villages. You can also choose to eat at a range of restaurants and hotels that are on the trail. Honorable mention must be made of the Udny Arms Hotel, Newburgh where Sticky Toffee Pudding was “discovered”. The local specialty Cullen Skink – fish soup – is also to be found on most menus. A traditional Scottish meal – The High Tea is also still served in the coastal towns where a variety of hot dishes usually including Fish and Chips is followed by, home baked scones, “fancy” cakes and a pot of tea. Although seafood is the mainstay of most good menus, it must be remembered that the farms of Aberdeenshire produce some of the finest beef in the world and this also features on hotel and restaurant menus. Aberdeen is Scotland’s third largest city after Edinburgh and Glasgow. Aberdeen has flourished for centuries as a trading center for the north east of Scotland relying heavily on its port to import and export goods. It is known as the granite city due to its many fine granite buildings with intricately carved granite details demonstrating the skills of its craftsmen working such a hard rock. With the growth of the North Sea oil and gas industry it has become known as the Energy Capital of Europe. This diversity of industry and rural countryside means that the area has something for everyone, whether you are interested in wildlife, archaeology, industrial heritage or architecture there is plenty to see and do. How many other major cities can claim to have dolphins, whales, otters and seals regularly seen within a kilometer of the City center, and peregrine falcons nesting above the main street! The North Sea Trail in Aberdeen is a varied route from the windswept dramatic cliffs between Cove and NiggBay, around the busy commercial Aberdeen harbor and northwards into Aberdeenshire as it follows the graceful sweep of Aberdeen Bay. The route goes through the industrial areas associated with the harbor, fish processing factories and yards storing materials and equipment en route to the North Sea oil and gas industry. It also passes close to the ferry terminal for passengers and vehicles traveling to the Orkney and Shetland Islands. North of the harbor the Trail follows the Esplanade along AberdeenBeach past the fun fair and cafes of the traditional British seafront to the tranquility of Donmouth Local Nature Reserve and northwards along the sand dune-backed beach into Aberdeenshire. There are plenty of places to stay in Aberdeen most of which are easily accessible from the North Sea Trail either on foot or by local bus. At the southern end of the North Sea Trail in Aberdeen, there are various pubs and hotels close to the path in Cove. Along the beachfront just north of AberdeenHarbour there are a number of cafes, restaurants and fast food outlets serving a wide range of food and drinks. With a population of approximately 354,000, is situated on the East Coast of Scotland. It forms a peninsula that covers an area of 1,323 sq. km miles and separates the estuaries of the River Tay to the north from that of the River Forth to the south whilst facing the North Sea to the east. Over the centuries the region has built up a rich cultural heritage based on its considerable natural resources of salt, coal, and timber. These together with the skills of its people have molded the kingdom’s history and impacted on the wildlife and extraordinarily beautiful scenery. From castles and caves to seals and dolphins there is a lot to explore both inland and on the beautiful coast. The region boasts 25 beaches, several of which have Blue Flag Award status and 20 golf courses along its shores, including the world-famous Old Course at St. Andrews. The Fife Coastal Path is over 90 miles long and at present runs from Culross on the Forth Estuary to the bridge over the River Tay and is integrated into The North Sea Trail development programme. A range of walking abilities is catered for, from the level and easy to the more challenging. The path can be enjoyed in short bite-sized chunks or as a long distance walk. For ease of navigation, the route is way-marked at key points. The path snakes around the FifeCoast, threading through old fishing and coal mining villages, Royal Burghs and climbs dramatic cliffs. You can see distinctive rock formations, long sandy beaches, picturesque fishing harbors and grass tufted sand dunes. Watch out for seals and dolphins as they play off the coast. Listen to the sounds of the seabirds as they soar above the waves, smell the fresh sea air and feel the real sense of freedom! From castles to cozy B&Bs, from caravan parks to country cottages, Fife has the widest range of holiday accommodation in the country. There are almost 500 places to stay, ensuring the widest possible choice of location and price. One of the most scenic parts of Scotland, East Lothian’s attractive coastline and countryside, picturesque towns and villages, and famous golf courses draw many visitors from around the world. Stretching from the eastern edge of Edinburgh to the North Sea and bounded by the Lammermuir Hills to the south, East Lothian covers an area of 435 km2. Seventy kilometers of magnificent coastline includes some of the finest beaches in Scotland. Inland, rich arable farmland lies in an open, rolling landscape, while to the south a string of unspoiled villages sits at the foot of the Lammermuirs – themselves a popular haunt for hillwalkers and naturalists. The county is home to 90,000 people and each year its population grows well above the Scottish national average. The John Muir Way forms East Lothian’s section of the North Sea Trail. It is named after the leading campaigner for America’s National Parks, who was born in Dunbar in 1838. The John Muir Waywill extend for 70Km between the outskirts of Edinburgh and the Scottish Borders. There are many options for walking the Way. It can be walked in short sections as ‘day walks’ with public transport available at many points along the route to return you to your starting point, or you may wish to walk a section as part of a circular route combining with other paths joining the Way. The route offers magnificent views of East Lothian’s diverse landscapes as well as the chance to experience unique cultural and natural heritage. Much of the East Lothian coast is recognized nationally and internationally for wildfowl and waders such as curlew and redshank. You are sure of a warm Scottish welcome when you come to East Lothian. There is a wealth of hotels, guesthouses, caravan or campsites to cater for your particular needs when visiting us. The North Sea Trail in England runs through two outstanding landscapes.These are special places – in Northumberland, you can walk within an “Area of Outstanding Natural Beauty” – in the North York Moors you will be in one of England’s National Parks. The Northumberland coast is best known for its extensive sweeping beaches, rolling dunes, high rocky cliffs and isolated islands. This is a stunning landscape, often peaceful – the beaches stretch for miles. You can walk for 103 kilometers along the Northumberland Coast Path section of the North Sea Trail. With stunning wildlife and the incredible heritage of its dramatic castles, there is a great deal to appreciate. In the NorthYorkMoorsNational Park, the North Sea Trail follows the coastal Cleveland Way National Trail for 80 kilometers from Saltburn to Filey. Again there is so much to enjoy from the inspirational cliff scenery to the haunting ruins of its Abbeys and Castles and also the beautiful former fishing villages, packed with quaint old cottages and winding streets. The North Sea Trail is currently being developed in Norway along the western, southern and south-eastern coasts of the regions of Møre og Romsdal, Sogn og Fjordane, Hordaland, Rogaland, Vest-Agder, Vestfold, and Østfold. It is possible to cross over from Scotland by ferry to Bergen and move either north or south from here on the North Sea Trail. The Norwegian coast is intersected by breathtaking fjords and mountains and the coast dotted with a variety of built environments from smaller farmhouses, fishing villages, and lighthouses to major UNESCO heritage sites like Bryggen in Bergen. The western coast is rougher and less populated whereas the towns and service facilities for hikers and ramblers become denser when reaching the south-eastern coast and the Oslo Fjord region. The North Sea Trail (Nordsjøløypa, in Norwegian) was first initiated in Hordaland, but now the other regions are catching up. In Aust-Agder and Telemark, who have not joined the North Sea Trail, the ramblers may be directed through on other existing trail networks. The North Sea Trail connects the Swedish west coast and Scania at one the same time part of the former Danish kingdom. This walking-route runs from the Oslo Fjord and Östfold in Norway, through Bohuslän, touches Gothenburg (Göteborg) and continues through Halland and Scania to Zealand in Denmark. The walker passes through areas ravaged for centuries by wars between Nordic sister nations. Various places along the route have interesting traditions and cultural heritage. The traditions and local culture in this area reflect their common history at the same time as exciting individual characteristics have developed. The route passes many interesting towns. But the scenery here is also varied. Experience a sense of wilderness and everything from the soft forms of southern Norway’s and Bohuslän’s granite and “mountainous” areas to the mixed forests of Halland and the fertile plains of Scania and eastern Denmark. Walk from Norway to Denmark via the west coast of Sweden and Scania and experience a wealth of natural and cultural history in the cradle of the North! In Denmark, the North Sea Trail runs along the southern and western coasts of Sealand. From here the trail continues along the eastern coast of Jutland from Grenaa, goes north to Skagen and continues south along the western coast of Jutland. Halfway down the west coast the trail moves inland and follows the historic ox-trails south into Germany. The length of the trail in Denmark is more than 1.500 km and is easy to reach and to walk along. 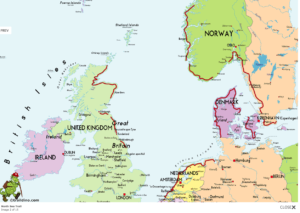 The North Sea Trail on Sealand starts in the southern landscape of Stevns at Roedvig and winds its way west along bays, fiords and inlets passing medieval castles, towns, and villages on the way. At Skaelskoer the trail moves north along the Big Belt and out to the very tip of the Peninsula of Sealand, where a ferry connection links the trail with the routes in Jutland. Along the way, it is possible to make detours to several islands, peninsulas and also inland. With the ferry from Sealand, you can reach Ebeltoft, the starting point in Jutland. From here the North Sea Trail moves north to Granå along the sheltered coast of Jutland facing the Kattegat. This coastal landscape is lush with farmland, forests, fjords, villages, towns, and castles. At Skagen, the most northern point in Denmark, the landscape changes, and from here the North Sea Trail passes southwards through areas with sand drift, which is not suitable for agriculture, but ideal for bird reserves. There are also many fishing villages and ports on this stretch of coast. Through the western landscapes of Ringkjoebing, Ribe and Soenderjylland the North Sea Trail moves inland and follows the historic Western Ox Trails, where live cattle from the15th century has been driven from the breeding areas in Jutland to beef markets in Northern Germany and the Netherlands. The landscape along the Western Ox Trail is rich in medieval churches, villages and archaeological sites and continues into Germany, where the trail is still demonstrable in the landscape of Karrharde. The German partner is Amt Karrharde, located just south of the Danish border. The landscape along the Western Ox Trail is rich in medieval churches, villages and archaeological sites and offers the potential for development as a long distance route. The trail is still demonstrable and in the landscape of Karrharde, Germany, there is an existent segment in good condition. In the southern part of Nordfriesland NORTRAIL/The Western Ox Trail will be linked to the Eastern Ox Trail and the North Sea Cycle Route. In Nordfriesland the project will have positive effects on the local employment by including the back areas of the touristically intensely developed coast and the island zones (Wadden Sea National Park). It will also contribute to the widening of the naturally short summer season. LAW® is the Dutch abbreviation for Lange-Afstands-Wandelpad (long-distance footpath), which includes markings and is described in walking guides. LAWs have simple white-red markings and a number of additional signposts. The Dutch part of the North Sea Trail will pass Friesland, Zeeland, Zuid-Holland, Noord-Holland en Groningen.